We offer year-round full service floral design for events, as well as floral arrangements for small, intimate celebrations. Whether you’re seeking an ethereal bouquet for your elopement or dreaming of floral chandeliers and breathtaking centerpieces, we want to hear all about it! 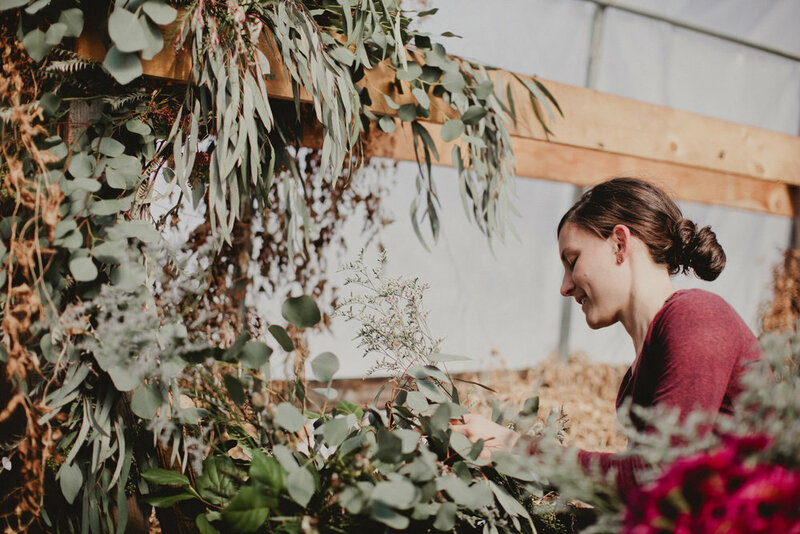 We’ll be there to guide you through the planning process and offer suggestions to illustrate your story through seasonal blooms and lush foliage. Please note: Events requiring delivery & setup will be subject to order minimums. Considering we do not have a retail storefront, materials are sourced specially for each event. During the off-season, unfortunately we cannot accommodate local deliveries for single arrangements. However, during summer months, we accept short notice orders on a case-by-case basis, when time and materials allow. If you’re interested in sending a birthday, funeral, or any special occasion arrangement, June thru September, reach out to check our availability. We love collaborating on photo shoots, pop-up shops, and workshops, so long as the opportunity is a good fit! Andrea is also available to teach private design classes. Get in touch if you’d like to inquire about any of these endeavors.